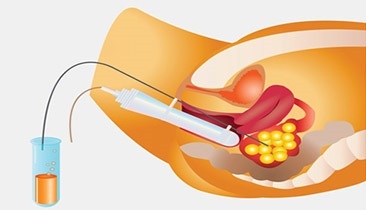 IVF is a technique involving stimulation of multiple follicles, retrieving those eggs and fertilizing with sperms in the laboratory followed by embryo transfer to the uterus. Am I a candidate of IVF? You may require IVF if you have any of the following issues. Tubal factor infertility like blocked fallopian tubes or pelvic adhesions, when the tubal surgery is technically unsuccessful or an alternative to surgery in patients of previous tubal sterilization. Male factor Infertility-When multiple IUI cycles fail or physical parameters are markedly deranged than IVF is the next step. Ovarian Failure or Diminished Ovarian Reserve. What are the factors on which success of IVF depends? How long does it take to complete on IVF cycle? One cycle of IVF usually takes about 2 to 3 weeks. The number of visits to clinic during this period is 4 to 5 only. The injections given during stimulation are not very painful as they are to be taken subcutaneous and with a very fine syringe. The process of oocyte retrieval or taking out follicular fluid is also done under I/V sedation so that you do not experience any pain during the procedure. There may be mild discomfort after the pickup that also only in very few patients. How different are IVF pregnancies from natural conceptions? Once the pregnancy test is positive, the IVF is in no way different from natural conception other than increased hormonal support during first few weeks. The progress of pregnancy, level of activity, diet and precaution all are same. If our first cycle fails, than what next? First step is to find out the cause of failed cycle-Was it less or poor quality oocyte, was there a problem in sperms, what was the grading of embryos ,how was the endometrial lining and finally if everything was fine then it could have been Implantation Failure. If any of the above factors can be modified, then it is done by changing the protocol, if there was any problem in eggs or sperms which cannot be corrected than we move to donor eggs or donor sperms program. We keep a minimum gap of two months between two cycles.